Fanny Crampton was born Marie Clementine Fernande Blanche Moreau on June 16, 1922 in the St. Lupicin district of Manitoba. 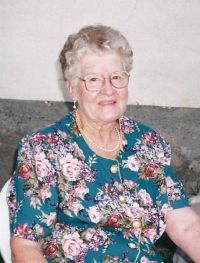 She passed away on March 28, 2012 in Boundary Trails Health Centre. Fernande married Allan Crampton on October 16, 1943. At that time she became Fanny Crampton because dad couldn't roll his r's very well. She was predeceased by her husband Allan in 1996. Leaving to cherish her memory are son George and Yvonne, daughter Ann and Albert, son Dale and Connie, son Sam and Paulette, Fanny has 11 grandchildren and 13 great grandchildren. The family would like to thank Dr. Jackson and all the great staff at Boundary Trails Hospital for the wonderful care they gave mom while she spent her last days there. A heartfelt thanks to all mom's loving friends, you know who you are, for the visits and support you have shown to mom over the past. You have all made this journey less difficult for all of us. A graveside service will be held in the Altamont cemetery in the summer.